The Energy Department's highly anticipated report on America's electricity grid is out, and our biggest takeaway is that it affirms generally accepted knowledge in the energy industry — cheap natural gas has been the primary factor causing coal and nuclear power plants to shut down over the last several years. It also contradicts comments Energy Secretary Rick Perry has made suggesting federal subsidies for wind and solar help shut down coal and nuclear plants. Bottom line: The report's findings, though not newsy in and of themselves, are notable because they show the Trump administration adhering to objective data despite rhetoric suggesting it might come to more politically driven results criticizing renewable energy. Perry has read the study and is on board with its conclusions, an Energy Department official said: "You can talk about his rhetoric, but he told us he was happy with the report," the official said. The other factors beyond natural gas in shutting down a wave of coal and nuclear plants, in the order listed in the report: Stagnant electricity growth, environmental regulations and the rise of intermittent wind and solar resources. The report says that the growth of renewable energy on the grid hasn't created any alarming problems, but that doesn't mean one can assume it won't in the future with greater penetration of renewables, so increased attention is needed. The study doesn't recommend the Energy Department intervene in state energy mandates, an idea Perry floated a few months ago. 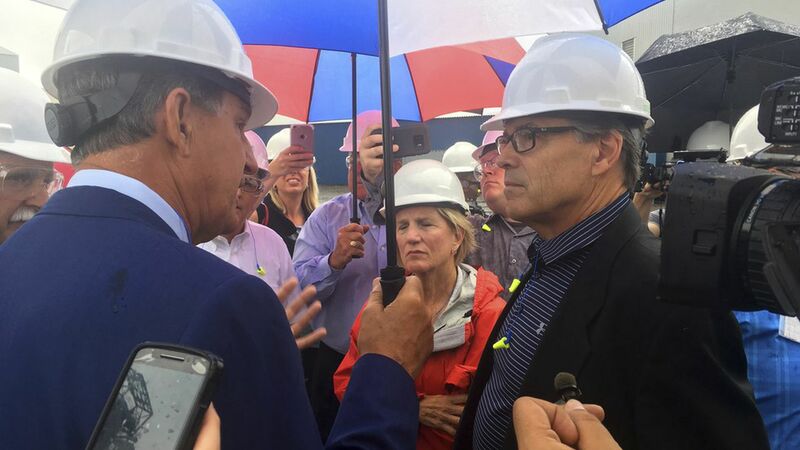 The authors didn't seek to answer that question nor does Perry have any intention of usurping states' rights, an Energy Department official said. One agency official expressed concern about how natural-gas plants don't have fuel on site, like coal and nuclear do, in case of emergency situations. To the small extent climate change was part of the study's formation, the authors stressed that preserving America's existing fleet of nuclear power plants, which emit no carbon, was essential. Yes, but: In a letter about the report also released Wednesday, Perry emphasized the factors of environmental regulations and subsidies and didn't mention natural gas, which by his own report's conclusions, is the biggest driving influence. "It is apparent that in today's competitive markets certain regulations and subsidies are having a large impact on the functioning of markets, and thereby challenging our power generation mix." Between the lines: Emphasizing how natural gas is the driving influence changing the power grid doesn't jive with the Trump administration's positions bolstering natural gas. Omitting it in the rhetoric related to the report but noting it in the report itself shows the delicate balance the Energy Department is striking on the issue. The report encourages the Federal Energy Regulatory Commission, an independent government agency that reviews energy infrastructure, to speed up its efforts working with grid operators on energy pricing. The report encourages the Nuclear Regulatory Commission, another independent agency that regulates the nuclear industry, to not "unnecessarily" add to the operating costs of nuclear plants. The report encourages the Environmental Protection Agency to allow coal plants to improve efficiency without triggering new permitting requirements.